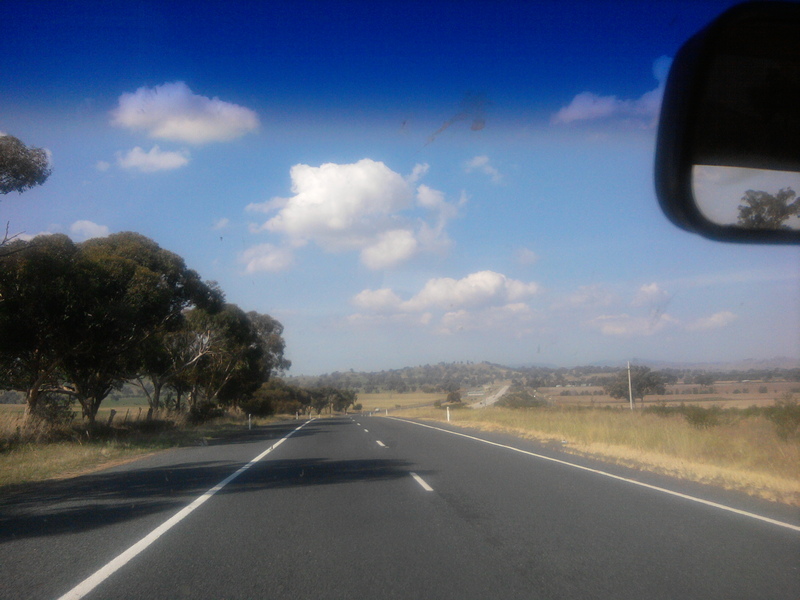 ← Back in Australia – and a week passes by…. I head up to Canberra on the Wednesday (April 4) to get to the Folklore Conference on the Thursday. After a diversion to the centre of Melbourne to pick up a passenger (Wim) who offered to share the fuel costs. The weather is sunny and warm so it looks hopeful for the festival, though as Canberra is just over475 km away (about 300 miles) it could be quite different. It’s actually about 650 km by road (about 400 miles) but the road is pretty good all the the way, dual carriageway all the way except for two short sections, so the trip took about 8/9 hours with a couple of breaks. 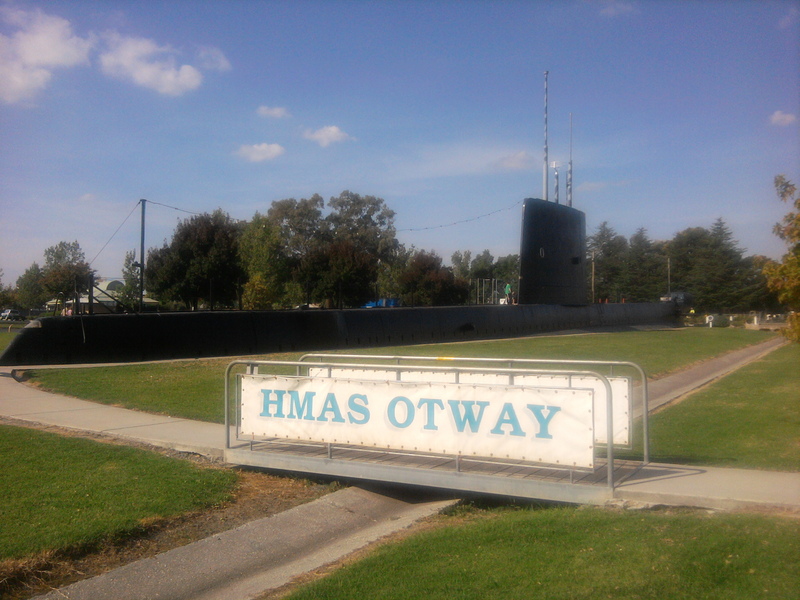 One slightly weird stop was at Holbrook, which has the upper part of the Oberon Class conventional subumarine HMAS Otway in the town park. The point of this was that the town was named after a British submariner who won a Victoria Cross in WW1 for sinking a Turkish battership in the Dardinelles. The town had been called Germanton (i.e. German Town) after a German immigrant, John Christopher Pabst, who was the publican of the Woolpack Hotel. Like many towns with german names they changed it during the first world war – as did the the British Royal family (who changed their family name to ‘Windsor’). After stopping off at the festival site to drop off my passenger and pick up my ticket and camping pass I head off meet up with Ian Blake who has kindly offered me a bed and – more importantly – a bathroom during my stay. 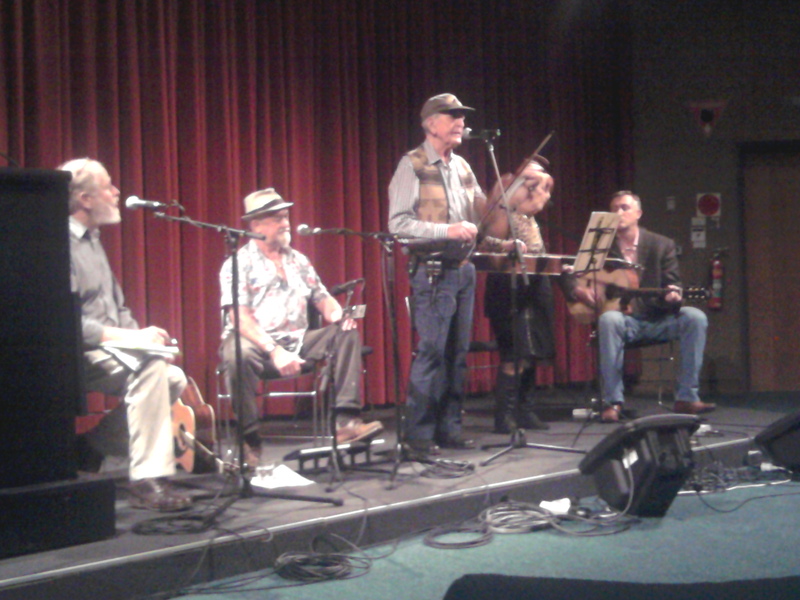 Thursday was taken up with the Folklore Conference which took place at the Australian National Library and featured talks on the role of music at the Australian Antarctic bases and expeditions by singer / songwriter Bruce Watson and a lecture about the bush poet (and Labour MP) John Keith McDougall who was a contemporary of Henry Lawson. This was presented by Dennis O’Keffe who has just published a book “Waltzing Matlilda – The Secret History of Australia’s Favourite Song” which I had bought in the local ABC shop as part of my research into the idea of doing a vaguely historical show of Australian song and spoken word. At lunch time there was a concert called “Yarns and Melodies” with a couple of pretty authentic Aussie country / folk characters. 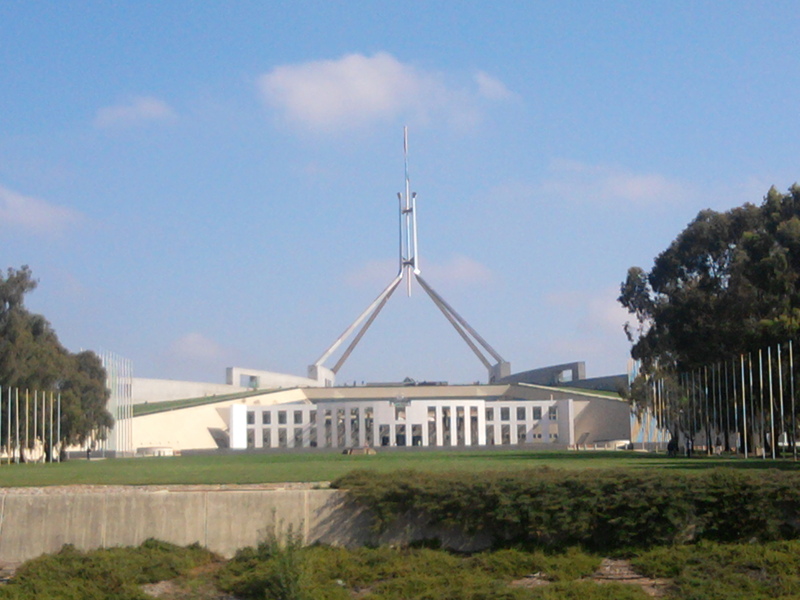 In the afternoon I ‘nicked off’ and walked up to the new Parliament House which I hadn’t seen before. The inmates (i.e. the federal MPs) weren’t there, but I had a wander around and a coffee on the terrace. I couldn’t help but compare it with the Palace of Westminster in London which I visited a few months ago to lobby my MP about the Lost Arts Campaign. As you might image the Aussie Parliament is a lot more relaxed than it’s British counterpart – also a lot more spacious and lighter than it’s predecessor. Back to the festival for the evening and another gig with Mandy, this time for the VIP Event before the main opening concert. The festival is a ‘green field’ type event except that there are a few permanent structures at the showground which can act as venues. As I mentioned in my last blog, one of my main aims at being at the festival is to suss out what the state of the social dance scene is. 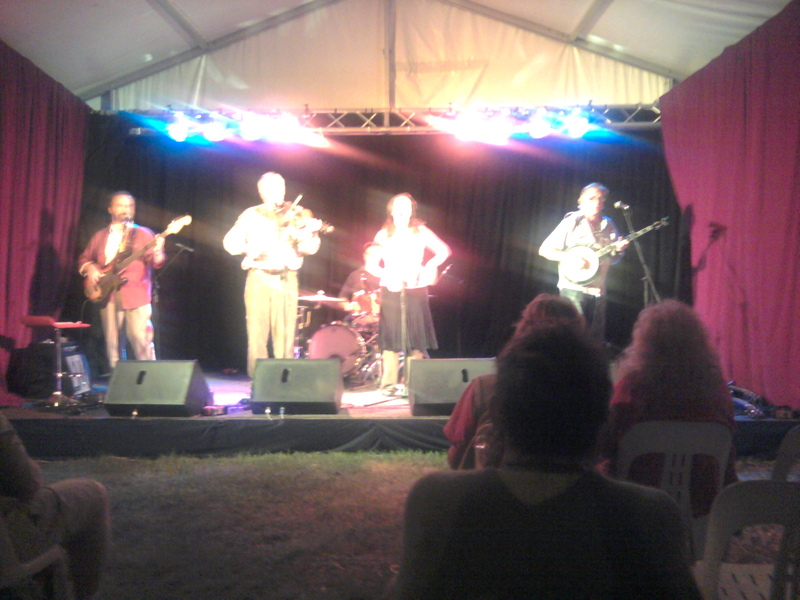 After the VIP gig I check out one of the Bush Dance events and it all seems pretty staid, with an ageing audience and a low altitude band. I’m pretty sure that this audience wouldn’t be into the kind of stuff that I do in the UK. I was beginning to think that if I wanted to work over here then I’d have to apeal to a different audience. ‘The Nash’ is a great festival as it has a load of things going on at any one time including at least three sessions in the ‘session bar’ as well as at least five ‘blackboard’ venues which have a mix of booked acts, acts which have come down ‘on spec’ to showcase and ad hoc collabourations of performers just taking advantage of the moment to try something new. While I’m not a great fan of musos doing something for no pay, this gives everone an opportunity to have a go. A bit different from the ‘closed shop’ that you get at British Folk Festivals. 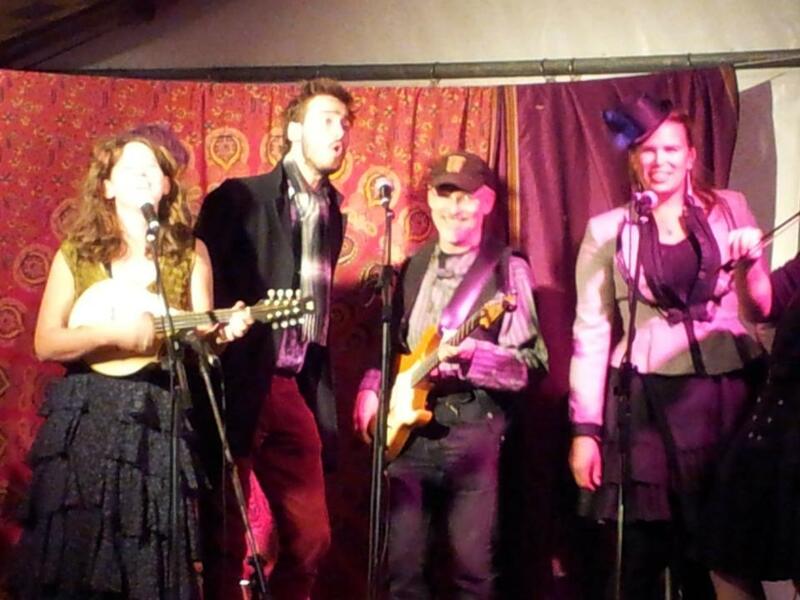 Sunday saw another gig with Mandy at the Bohemian Bar which when down very well, though the stage was pretty crowded. This was a much longer set of one hour so we went though a fair amount of material. 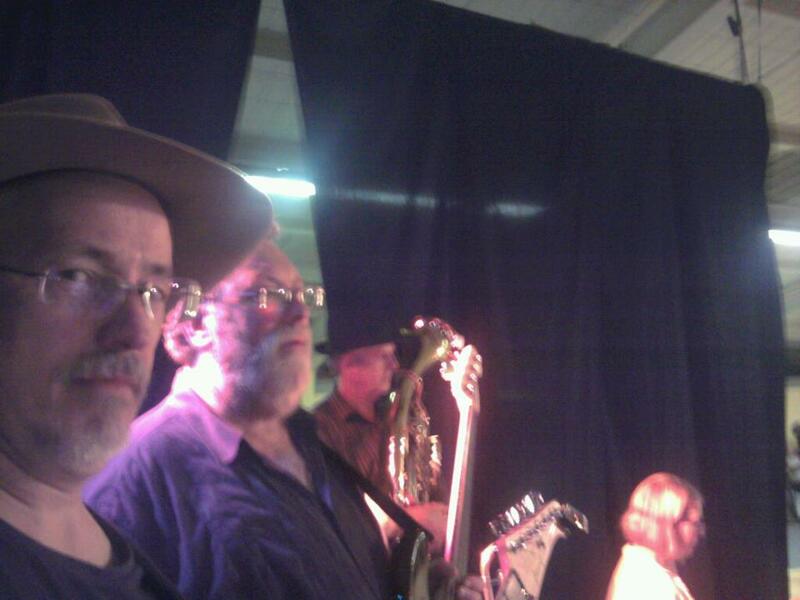 I had the electric again and put a killer solo into a rather tasteful harmony song. 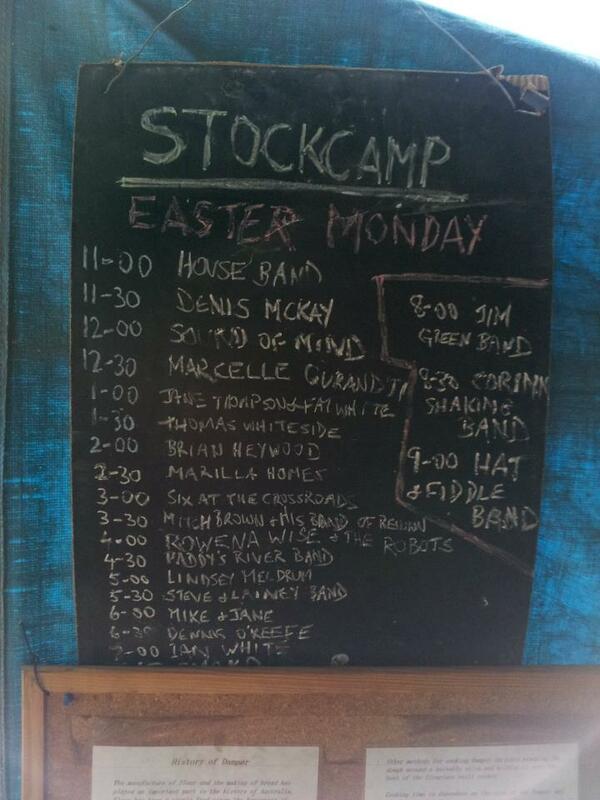 Monday saw me performing under my own name at the ‘Stock Camp’ venue with the assistance of Ian Blake on sax and a spot with the lovely and talented Marilla Homes for a somewhat under-rehearsed version of Summer Time. 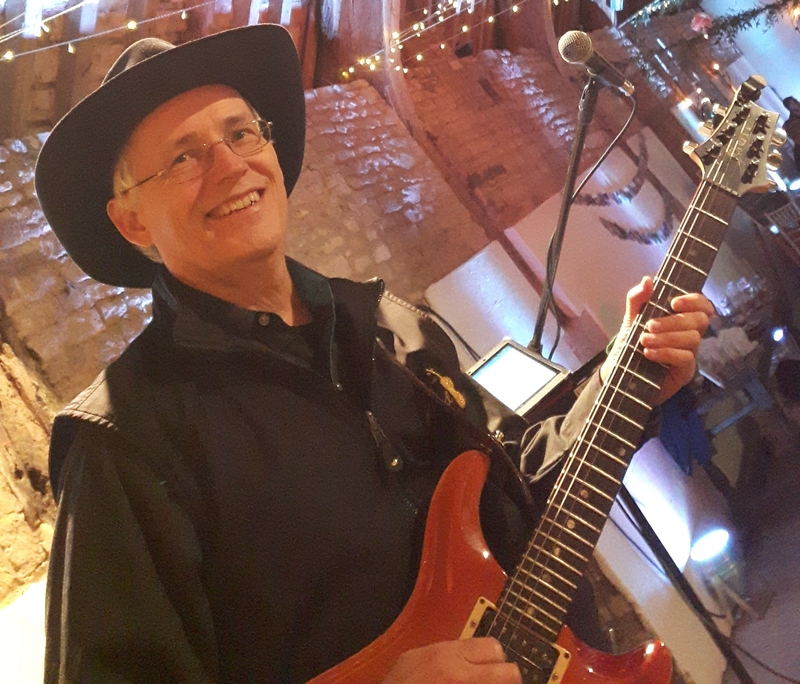 In the evening we had a final session with Mandy’s band – nicknamed ‘The Minions’ – which had gradualy grown in size over the weekend until it managed to get ten players on stage for the last gig at the Scrumpy Bar. All through the weekend I was knocked out by the wonderful voice of Lindsey Meldrum who was helping out Mandy on backing vocals and credits also go to Stirling Gill-Chambers on fiddle (Spooky Mens’ Chorale), ‘Charles De Vermin’ (Rapskallion) on mandolin and Leonard Podolak (banjo) from the Dry Bones. 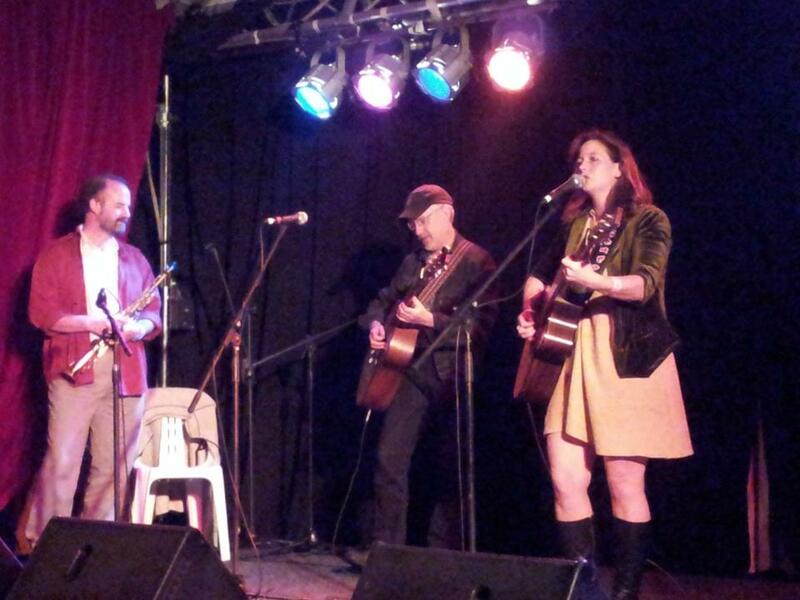 This entry was posted in Brian's Diary, Uncategorized and tagged Australia, Brian Heywood, Canberra, ceilidh, Dennis O'Keffe, entertainment, folk, HMAS Otway, Holbrook, Ian Blake, live music, Mandy Connell, Melbourne, music, National Folk Festival, politics, Rapskallion, road trip, Waltzing Matilda. Bookmark the permalink.